Carpet is a big investment that requires regular maintenance. That’s why there are so many carpet cleaners out there vying for your business. Not all carpet cleaning companies are created equal — so how do you choose the right one? It’s as simple as knowing the right things to look for. True expertise comes from years of experience in the industry. That’s why the length of time a carpet cleaning company has been in business is a key factor to consider. Longevity in the field of carpet cleaning shows that a company delivers results customers are satisfied with—otherwise they wouldn’t have stayed in business. It also shows that they understand the best methods to use in order to provide the highest quality service. Years of experience proves that a company isn’t just backed by lip service, but actual results. Since 1977, Chem-Dry has been one of the nation’s premier carpet cleaners. With over 40 years of experience in the carpet cleaning industry, you can trust us to provide the best carpet cleaning service in Oklahoma City. A significant benefit of online business is the ability to view customer reviews. It’s important to note that a couple of negative reviews is normal and can actually be a good thing; it shows that the reviews are genuine. If there are a lot of negative reviews or the company has a low overall star rating, this could be a red flag. Take advantage of this feature by doing a Google search of any company and see what customers who have used them in the past have to say. A common mistake people make when selecting a carpet cleaner is automatically going with the cheapest option. This shouldn’t be your main reason to choose or not choose a carpet cleaning company. The truth is, in most cases, you get what you pay for. And if it sounds too good to be true, it probably is. Focus on customer reviews and industry experience first. Once you’ve narrowed your options down based off of those factors, look for carpet cleaning specials or promotions offered by those companies. You should also look for companies that offer free price estimates prior to paying for or scheduling their services. Traditional steam cleaners use a lot of water and soapy residue—which means longer drying times, a higher chance of mildew growth and reappearing stains, and a negative impact on the environment. When it comes to the method used to clean your carpet, be aware of innovation and environmental impact. Look for carpet cleaning solutions that are non-toxic and green—not packed with harsh chemicals and too much soap. Also, beware of carpet cleaning methods that use unnecessary amounts of water – i.e. high-pressure steam cleaners. This will be better for your family, pets, and mother earth. Choosing a carpet cleaning company you can trust is easy when you know what to look for. With these 5 tips, you’ll be able to select the highest quality, affordable service in your area. Did you know that Chem-Dry uses the revolutionary power of carbonation to clean carpets with 80% less water than steam cleaners? 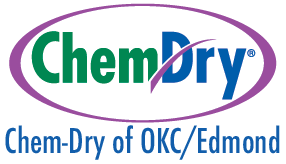 Get your free quote from Chem-Dry of OKC/Edmond — serving Oklahoma City, Edmond, Yukon, and the surrounding areas.